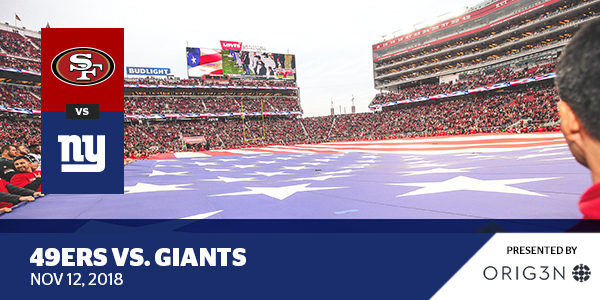 The 49ers will host the New York Giants in the team’s final primetime game of the season on Monday, November 12th. This will be the Salute to Service game and every guest in attendance will receive a cheer banner. The game is presented by ORIG3N. We ask that all guests attending this event view the stadium event guide prior to your arrival. Will call is located at the Visa Box Office and opens at 1:45pm. Walk-up tickets may also be available at the Visa Box Office. The Visa Box Office opens at 1:45pm and is located at the north end of the stadium inside Toyota Gate F.
Will call opens at 1:45pm and is located at the Visa Box Office. 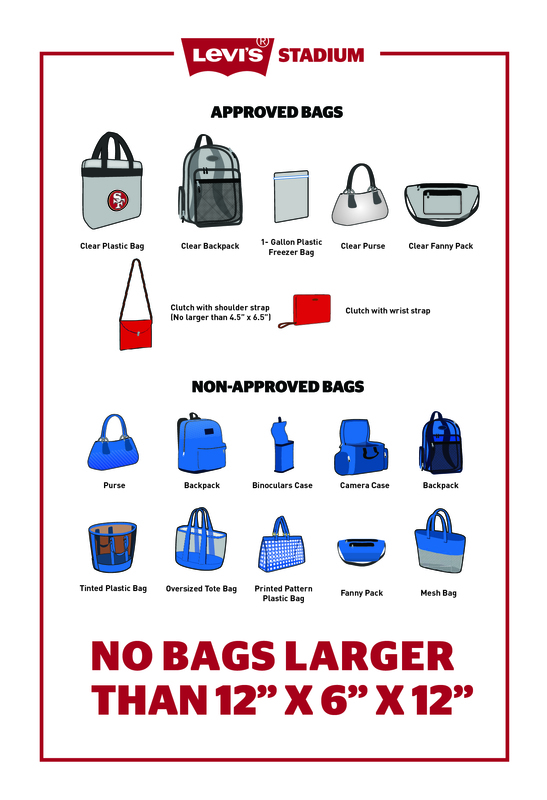 Levi’s® Stadium is providing 49ers fans with even more opportunities to enroll in TSA Pre ✓®! At limited games we will have the TSA Pre ✓® mobile RV parked in the Green Lot where you can complete the entire enrollment process for $85 with your passport or birth certificate. Existing TSA Pre ✓® members who are also season ticket holders can stop by the RV to obtain an IdentoGO Fast Pass sticker for faster entry into the stadium at Gates B & F. Look for the RV on 10/21, 12/9 and 12/16. As always, you can enroll for TSA Pre ✓® inside the Faithful Mile at the IdentoGO pod at every home game this season. To pre-enroll and schedule an appointment visit IdentoGO.com/SanFran. Did you know you’ll receive a $10 discount off the standard purchase price if you buy in advance on Ticketmaster.com? Parking lots are scheduled to open at 1:45pm and all guests must be in possession of a valid event ticket, pass, or credential to park in a designated parking lot. Cash and credit lots (day of event parking) will be made available on a first-come, first-served basis in all parking lots. Prices will be $10 higher than if purchased in advance. Cash and credit lots for this event are Green Lots 1 and 3, Blue Lot 1, Red Lots 1 and 4 and Yellow Lots 1, 2 and 3 are available via prepaid parking passes. 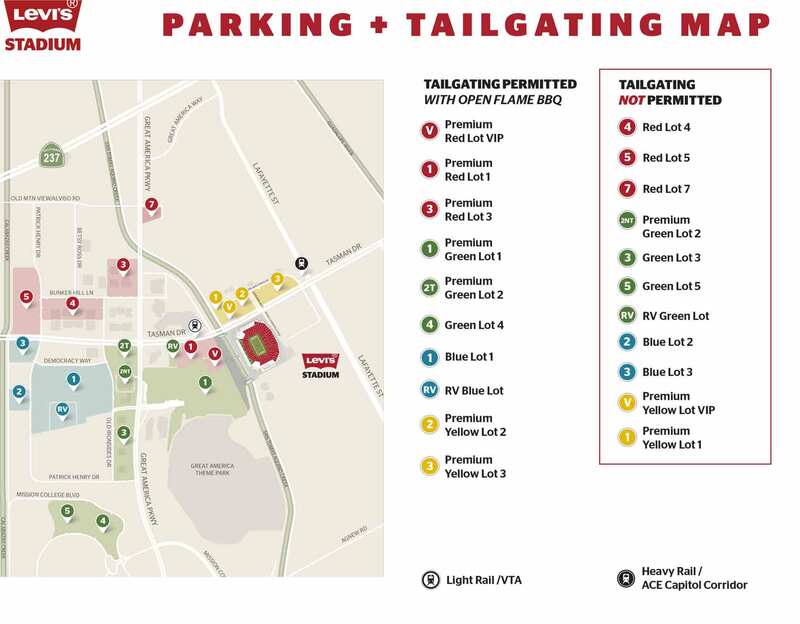 Mobility services will be onsite at 1:45pm to provide roving carts throughout Green Lot 1 for assistance to stadium gates. 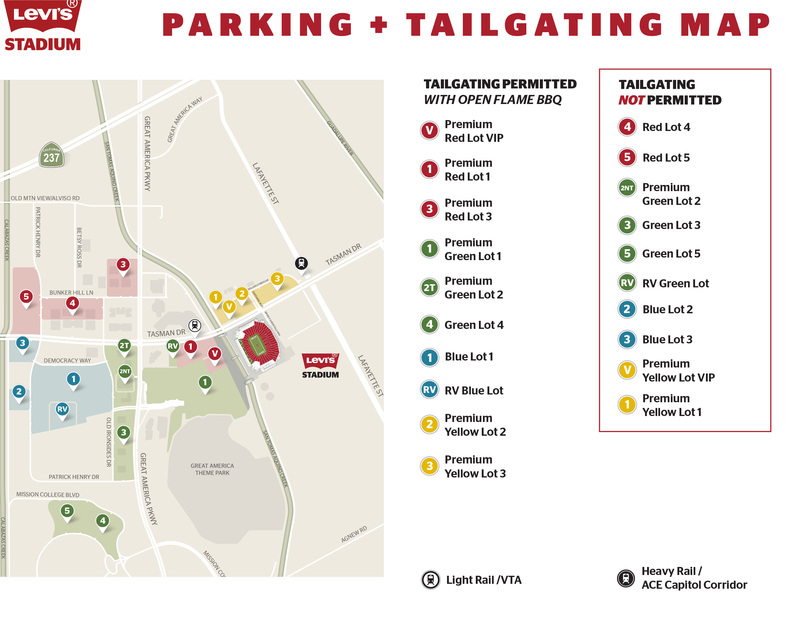 Bicycle parking will be located in Red Lot 1 and Green Lot 1 and opens at 1:45pm. All ticketed guests will be permitted the use of the San Tomas Aquino Creek trail beginning at 1:45pm. The Silicon Valley bicycle coalition will be administering this operation. 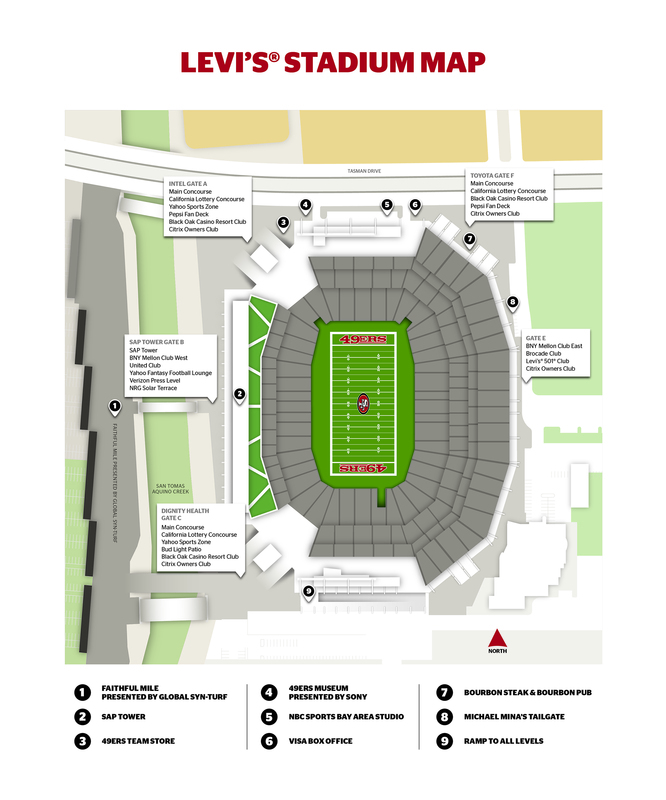 Amplified noise is not permitted in Levi’s Stadium parking lots & all tailgating must end at kickoff. Caltrain provides services from San Francisco to South San Jose with stops all along the peninsula. On event day, Caltrain transports passengers from all locations to connect with VTA light rail trains or buses at the Mountain View Transit Center, located at Evelyn Ave, and Castro Street. Fans heading to the game can get off at the Mountain View station and transfer to VTA light rail to Levis’® Stadium. Caltrain will be running a regular schedule to the game and one extra postgame train will depart 60 minutes after the game ends.